Totesport is the new premier gambling place. New customers - simply sign up for a totesport account, place your first bet with a stake between £5 & £25 and we'll credit your account with an equivalent free bet. It's as easy as that! 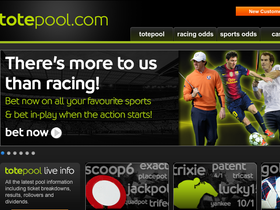 Now at ToteSport.com you can try over 100 games for free to prepare yourself to play with real money. ToteSport.com offers all new players a 100% first deposit bonus (up to max £100). Totesport.com will have 5 cash prizes up for grabs for the 5 highest wagering BlackJack players totaling up to £1,000. Upon making your first deposit or transfer to gaming chips at Totesport.com you will become an ‘Emerald Club Member’ and be entitled up to a 50% Monthly Bonus. Now at Totesport, get a free £25 bet for new customers.